Experience the best of The City of Light on one of our bestselling Paris tours. You’ll experience all of the sights, sounds and flavors of Paris. If it’s the flavors of Paris you crave, try our food tour through Le Marais. You’ll sip champagne and feast on the best of Paris’ street food and brasserie fare. Savor every moment of your Paris visit with The Paris Guy. Crêpes descend from the Ancient Greek pancakes Tagenites Attanitai. These pancakes were mentioned numerous times in Ancient Greek comedies written by authors like Cratinus and Magnes. The modern-day crêpe originated in France’s Brittany region and are traditionally served with French cider. Crêpes are similar to Ethiopia’s injera bread, India’s dosa and Russia’s blini. Crêpes are one of the world’s most versatile foods. They are enjoyed in both sweet and savory form. Sweet crêpes are also known as crêpes sucrées. Some popular sweet crêpe fillings include Nutella, fresh fruit, preserves and syrup. Savory crêpes are also known as Breton galettes or crêpes salées. They are usually served with ham, cheese (usually Emmentaler), chicken, eggs, or vegetables. Crêpes are eaten at any time of day, whether for breakfast, lunch or dinner. A popular variety of savory crêpe is the galette saucisse, a traditional Brittany region recipe which involves a savory crêpe wrapped around a sausage. The galette saucisse is very much the French version of a hot dog or a pig-in-a-blanket. This variety of savory crêpe is generally eaten plain as the presence of dressings such as ketchup or mayonnaise is considered unacceptable. However, Dijon mustard is now viewed as an acceptable dressing for galette saucisse. Other galette saucisse toppings include black pepper, raw onions from Manche in the Normandy region and caramelized onions. 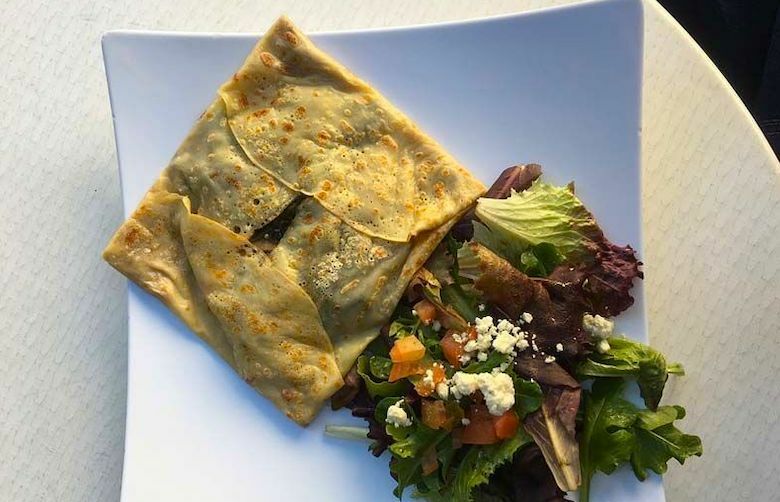 Another popular variety of savory crêpe is the galette complète or complete galette. This savory dish consists of a buckwheat crêpe with ham and a fried egg covered in grated Emmentaler cheese. This dish is similar to the American bacon, egg and cheese sandwich. What Are Crêpes Made Of? Crêpe batter is very simple to make. A typical French crêpe batter consists of butter, flour, sugar, salt, milk and eggs. Sweet crêpe batter is made with wheat flour, while buckwheat flour is used to make savory crêpe batter. Many French families add beer to the crêpe batter in order to yield lighter crêpes. How Are Crêpes Different From Pancakes? While similar to traditional pancakes, French crêpes have a few key differences from their American counterparts. The main difference between pancakes and crêpes is their consistency. Pancakes are thicker and much fluffier than their French counterparts. This consistency is due to the presence of a leavening agent in pancake batter, usually baking powder or baking soda. French crêpes are a popular street food all over the world. This is due to their portability and versatility, making them a great option for a quick snack or a meal on the go. The presence of crêperies, small restaurants or stands that serve crêpes of all varieties, has grown past France. Crêpes are a unique and accessible way to experience French street food. They are easy to make at home and are fairly easy to find outside of France. Try a French crêpe the traditional way; paired with a glass of French cider. If you’d like to try this pairing in its place of origin, be sure to check out our guided tour of Normandy which features all of the Normandy region’s historic sites with a break for or crêpes and cider. Our Le Marais food tour also offers authentic French crêpes as well as other popular French street foods. We offer a large selection of bestselling Paris tours so you can make your visit to Paris a memorable one with The Paris Guy.